Left and Right May Not Be Happy with the New AP Standards. Here’s Why You Should Be. Jeremy Stern holds a Ph.D. in history from Princeton University; an independent historian and history education consultant, he has reviewed and prepared educational materials for organizations including the Thomas B. Fordham Institute, Great Minds, the Southern Poverty Law Center, and several state governments. 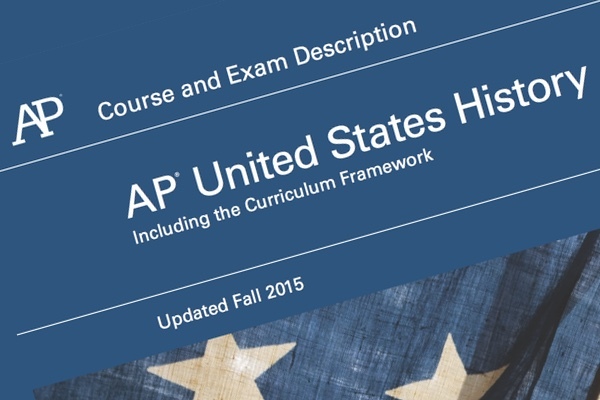 The AP US History framework (APUSH) that took effect in 2014 aroused a firestorm of controversy and criticism, chiefly from the right – quickly mounting to accusations of conspiracies to impose an unpatriotic, anti-American mindset in students; denunciations by state legislatures and the Republican National Committee; even Ben Carson’s declaration that the APUSH course would leave students ready to join ISIS. Many such critics failed to grasp the actual purpose of the document: it is not a comprehensive curriculum for APUSH classrooms (let alone an imposed mandate for all high school students), but rather a guide to the content that would appear on the redesigned APUSH exam.1 Thus, accusations that X figure or Y event had been “erased” are nonsensical: AP teachers choose their own substantive details to illustrate the framework’s broader concepts. Most organizations respond to criticism by circling the wagons and preparing for battle. Instead, to its lasting credit, the College Board took substantive criticism seriously, both from analysts with an explicitly conservative outlook (such as Chester Finn and Rick Hess) and historians such as myself. Teacher feedback would normally lead to minor revisions, but the Board instead announced an open comment period, soliciting input from all interested parties.3 The result was an extensively revised 2015 version, which has commendably sought to strike an ideologically balanced middle ground, presenting the realities of the past – good, bad and ugly – in historical context and without presentistic judgment. The 2014 version, for example, repeatedly singled out the British North American colonies as uniquely intolerant, violent and oppressive (unfavorably comparing them with the frequently brutal Spanish empire). In the 2015 version, slavery and violence against Native Americans are not “whitewashed,” but are put into wider historical context. The Atlantic slave trade, discussed in 2014 almost uniquely in terms of British North America, in fact predated those colonies by a century, and the vast majority of slaves actually went to the Caribbean and Brazil; also, powerful African states captured and sold virtually all the slaves bought by European traders on the African coast – all points the revision correctly notes, while still emphasizing the colonies’ extensive reliance on slavery. The complexities of inter-Indian warfare and native-colonial alliances are also acknowledged, without downplaying the tragic costs of European colonization for native peoples. The historically crucial rise of relatively egalitarian societies and representative political institutions in the colonies – all but ignored in the 2014 version – is now given due weight. What was egalitarian by 17th century standards is of course absurdly limited to modern eyes, denying even basic rights to women and non-whites – but one must understand why and how such societies and institutions were exceptional for their time to understand the foundation on which later expansions of freedom were laboriously built. Likewise, the Jacksonian rise of near-universal white male suffrage, an extraordinarily radical concept in its day (barely mentioned in the 2014 version) is now properly described in the revision. The benefits and costs of industrialization and urbanization are now notably balanced – without downplaying the terrible realities of urban poverty and labor exploitation. In the 2014 version, western settlement was discussed almost entirely in terms of its dire impact on increasingly besieged native peoples, with no attention given to the settlers’ aims and worldview (a crucial part of the story, whatever we think today of their actions in pursuit of those aims); now, Indians’ plight and resistance receive just as much weight as before – but the settler viewpoint is explained as well. The 2014 framework seemed to invite students to condemn the use of the atomic bomb on Japan in 1945; now it is presented as a disputed point. Coverage of the Reagan era – always difficult ground, given its contested place in today’s political battles – came across as dismissive in the 2014 version; now it notably avoids taking sides, presenting both the roots and goals of the New Conservatism as well as its critics’ views. Other changes simply improved substance and clarity. The key role of Washington and the first Congress in making the constitutional system work is now noted. The reasons for colonial objections to parliamentary taxation are now discussed, making better sense of Revolutionary grievances.4 The blind-spots of some Progressive-era activists towards minorities and immigrants are now given appropriate and contextual coverage (thus expanding discussion of racial segregation and the prevalence of violent racial prejudice). None of these changes even remotely amount to “triumphalism.” Slavery, war, poverty and minorities’ long struggles for rights and recognition are not downplayed or whitewashed – they are simply presented in context, without a biased tone of presentistic judgment. The aim, indeed, was never to swing from left to right, to replace one bias with another. Conservative critics were an important source of input – but so were historians and educators, myself among them, who were not on the right. I would have fiercely opposed any simple move to the right: I am just as critical of right-wing bias as of left-wing bias… as my review of Texas’s grossly ideological 2010 social studies standards should make clear. The aim, as much as possible, was to achieve a balanced document, describing past events in historical context on their own terms, not through the eyes of present day moral judgment. Such backlash was inevitable: since pressure against the 2014 framework (much of it irrationally extreme) came chiefly from the right, any change would be viewed by the left as craven surrender, and presumed to be a sanitized, triumphalist whitewash. (A shallow media narrative and social media meme – College Board folds under right-wing pressure! – has not helped people view the revision on its merits.6) In short, the framework became a symbolic political football – for both sides – more than a matter for substantive debate. But the problem is even more fundamental. Many on both left and right don’t want history to be taught with neutrality, balance or context – for they believe history education should inculcate a particular ideology… even if they differ violently on which ideology should be promoted. Many on the right want a vision of America that sanitizes past injustices at the root of present-day grievances. Many on the left promote a decontextualized condemnation of the past, urging students to assail historical actions as if they occurred amidst today’s pluralistic ideas of rights and diversity. In fact, all such ideological indoctrination is not only bad history, but bad civic education. Students can only understand history on its own terms – and they can only understand the nation as it is today if they understand where all parts of it came from, not only those given a selective stamp of political and moral approval. There is an indisputable need to include those previously excluded from America’s narrative; focusing only on those who were dominant – as too many on the right still seem to prefer – leaves out the history of most Americans! But now, too many on the left wish to exclude the previously included, or reduce them to simplistic villainous caricature. None of this makes for informed citizens with a sophisticated understanding of who we all are and where we all came from – and how today’s pluralistic values, against which so much of our past does look so ugly, ever became possible. Critics on both extremes grossly exaggerate the power of the APUSH framework, describing it as if it were a sinister mechanism to program students’ minds. Yet, sadly, many on both extremes would clearly love to have just such a device – so long as they alone controlled it. I have no illusions that my arguments will persuade those on either ideological wing in this fight: my aim is to reach those who care about genuine history education, or are simply wondering what all the fuss is about. Nor do I claim that the new version is perfect or beyond legitimate criticism. There are still points that might be clearer, or more nuanced – and there will be a new revision in 2020. But on the whole, the College Board has made an admirable effort to thread the needle: responding to legitimate criticism while avoiding excessive overcompensation. The 2015 revision offers much for those who approach the past without a present agenda. Educators should seek neither to attack the past nor to glorify and sanitize it; they should seek to explain historical content in as balanced and contextual a manner as possible. The College Board has made substantial strides towards that ideal in its revised framework. 1The framework lays out the facts and concepts that may appear on the AP exam – replacing a vague, decades-old outline that left almost anything fair game for the exam, pressuring students to memorize every possible detail. The redesigned exam eliminates trivial-pursuit style multiple choice questions in favor of questions interpreting short texts in historical context, focusing on historical comprehension instead of rote memorization. In the first year of implementation, teachers reported that the new framework had freed up an average of 28 instructional days, which could now be spent on primary documents and more in-depth study. 2 For a detailed examination of the 2014 version, see Jeremy A. Stern, “An Appeal for Sanity: A Real-World Look at the Purpose, Strengths, and Weaknesses of the 2014 AP U.S. History Framework,” The Journal of the Gilded Age and Progressive Era 14 (2015), 400-411. 3I was a public critic of the 2014 edition, and during the open comment period, the College Board requested my detailed critique. Many of my concerns were directly addressed in the first wave of revision, but as the process neared completion, I was brought in as a formal consultant to offer suggestions for final changes. 5 In actual fact, the vexed term “American exceptionalism” (which invokes a notion of unique American destiny and virtues, and is not a favorite of mine) appears just once in the 2015 revision – last on a list of general themes related to concepts of national identity. That has proved too little for many on the right, and too much for many on the left. 6 The day before the revision was released, Newsweek ran an online piece headlined with a claim that “American exceptionalism” was now the dominant concept in the framework. Further down, they admitted they had not yet seen the document.